When the Serpent Bites by Nesly Clerge tells a riches to rags story of a man, Frederick Starks, who has anything and everything the money from his successful business empire can buy. Along with that, he has a beautiful wife, three children, a loving family and friends, and well wishers as far as the eye can see. Life is about to get a whole lot less pretty for Starks, though, as one night of rage leads to a whole different reality. Starks' well-heeled life takes a turn for the worst, and he goes from being a hugely powerful man in the corporate world to the newest inmate in a maximum security prison in what seems to be the snap of a finger. 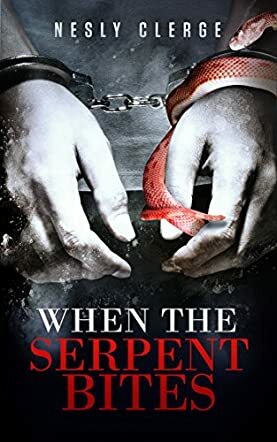 I've always enjoyed a good legal drama so I was glad to grab a copy of Nesly Clerge's When the Serpent Bites, although I wasn't expecting to be riveted to the pages. I was sucked right into Frederick Starks' life and drama, and I had more than one late night when I had to stay up and read far later than I would normally have. This does not read like an amateur novel. The characters have real depth - something I am big on - and the drama on the pages made me feel as though I was right there watching it. The book is fast paced and, in my opinion, downright amazing. You will get to the end of this book and want more, more, more! This is less a legal drama than the story of finding a way through a new life, but it is no less worth the read for that.